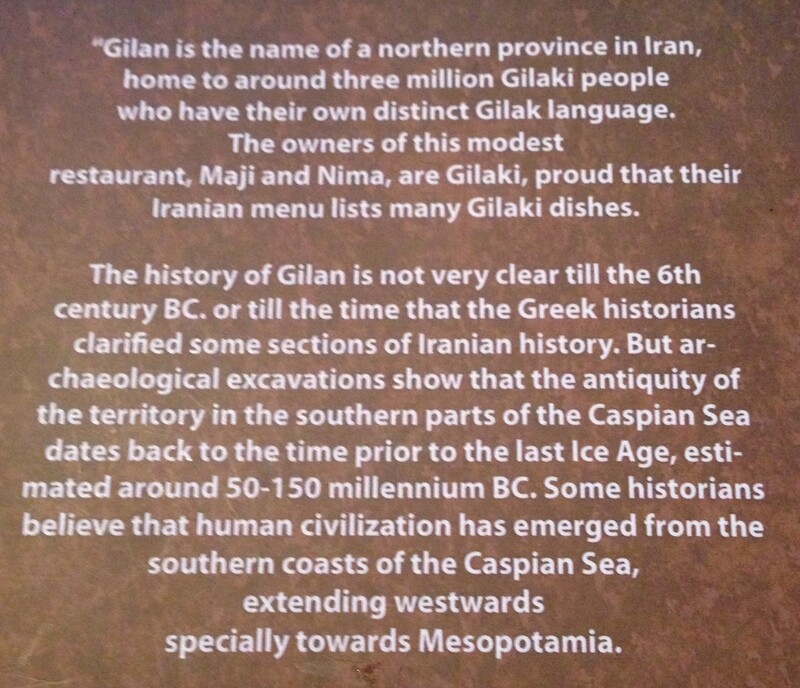 Gilak | Restaurants of the World Unite! People often ask me “Charlie…” before I smack them in the mouth with the fat end of a pool cue then loom over their prone, cowering body and say “That’s Mr Del Monte to you.” Often what follows is muffled through broken teeth but I make out “Where did you eat last night?” To be fair, Dr Liebowitz startled me whilst engrossed in an article I found in a Chat magazine from 2008 in his waiting room (pregnant at 65 – now I’ve seen everything!). But he’s insisted on referring me to a new gastroenterologist all the same. Let’s hope Dr Enkelmann minds his manners. 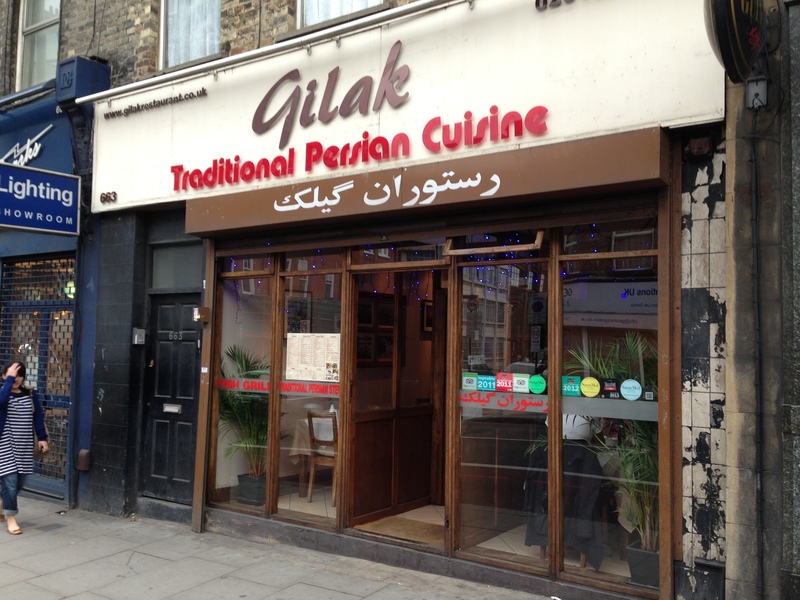 In answer to his question, I dined with my little sister, Dangles Del Monte, at Gilak (http://www.gilakrestaurant.com/) in Archway, proudly serving Iranian / Persian cuisine since an earlier date. 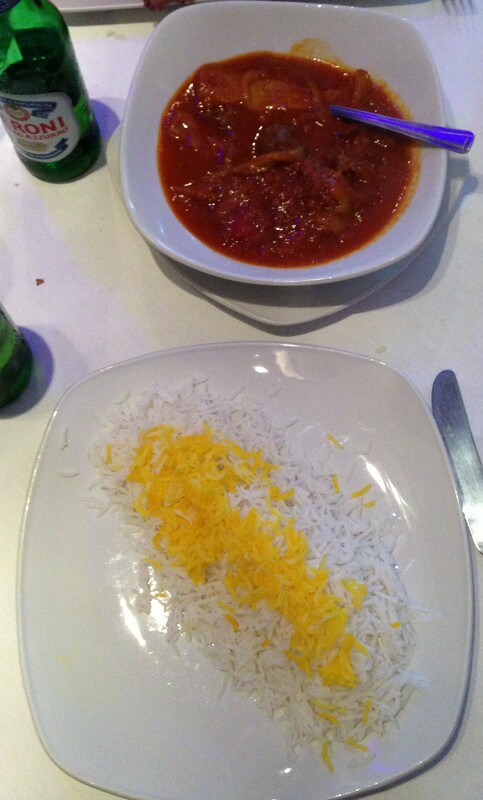 Iranian food is the tops, though I rarely venture from lamb skewers, minced or diced, with the buttered rice and grilled tomato. Dangles insisted that we try something new (now at last a reason for confiscating her My Little Pony collection as a child: It was pre-emptive karma all along) so we ordered and waited in silence whilst enjoying a tall, cool Peroni, the most Iranian beer on the menu. Maybe now Ahmadinemidget is gone they’ll step it up some. It’s what the people want. The Mirza Ghasemu, an aubergine goo, was smokey and moreish, but the special was plain peculiar: smoked fish, preserved walnuts and broad beans. The latter had to be shelled and were somewhere between almonds and water chestnuts. 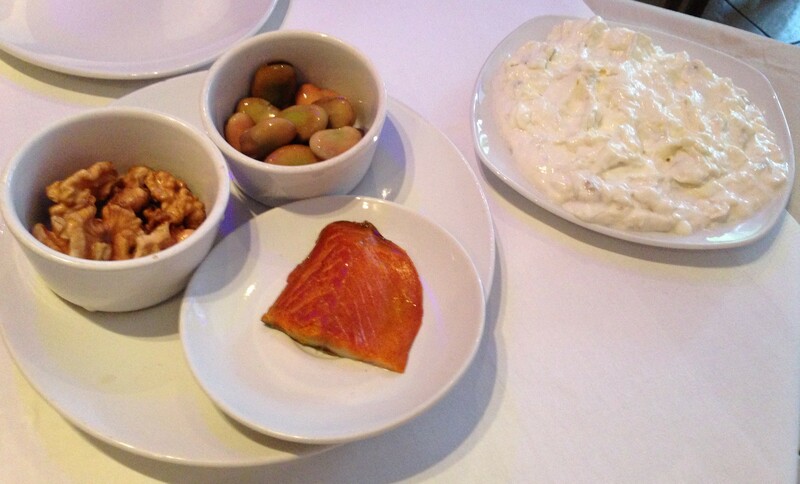 The smoked fish was nice enough but no different from smoked fish from elsewhere. Dangles’ chicken skewer (Joojeh Kabab) was stupendously big, but my Koresht Bademja, lamb stew, was unexciting. Salt livened it up some, but it was lacking a tang. 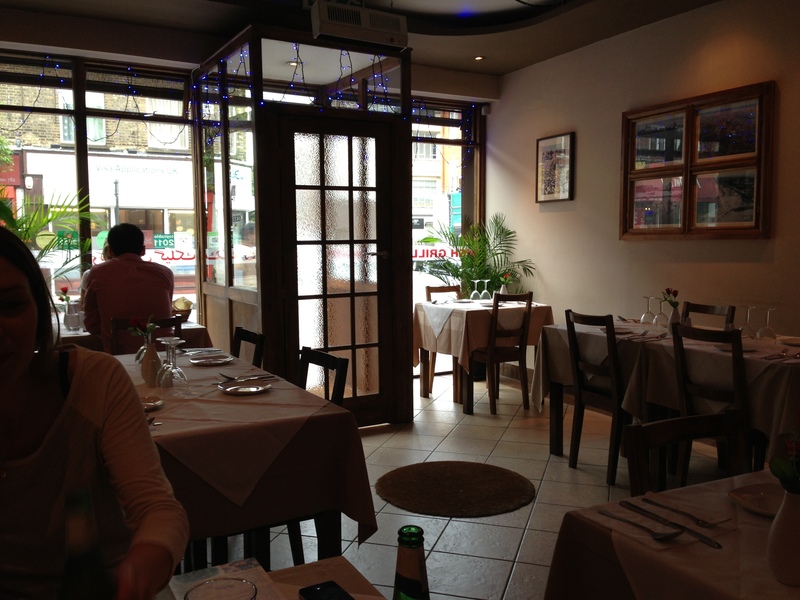 I love Madhi (http://www.mahdirestaurant.co/) in Hammersmith, which is cheap and delishkous. 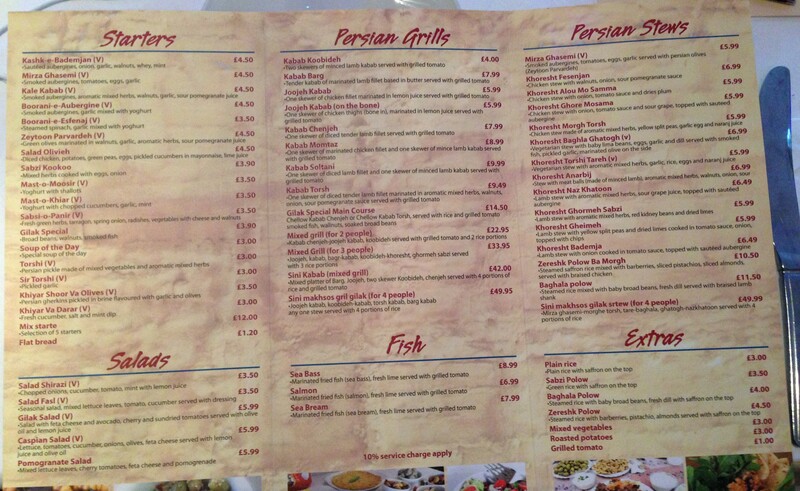 I also like another Iranian place I went to but can’t remember. That’s the definition of being not at all helpful. Does the aubergine goo on the right not look more special than the special starter? Dirty great lumps of chicken. The entrance is a trap. Woah woah woah! Woah. Cool out. Pilau rice. Pilaf. Peleau. Pulao. Palau. And now I see POLOW? Get it together! 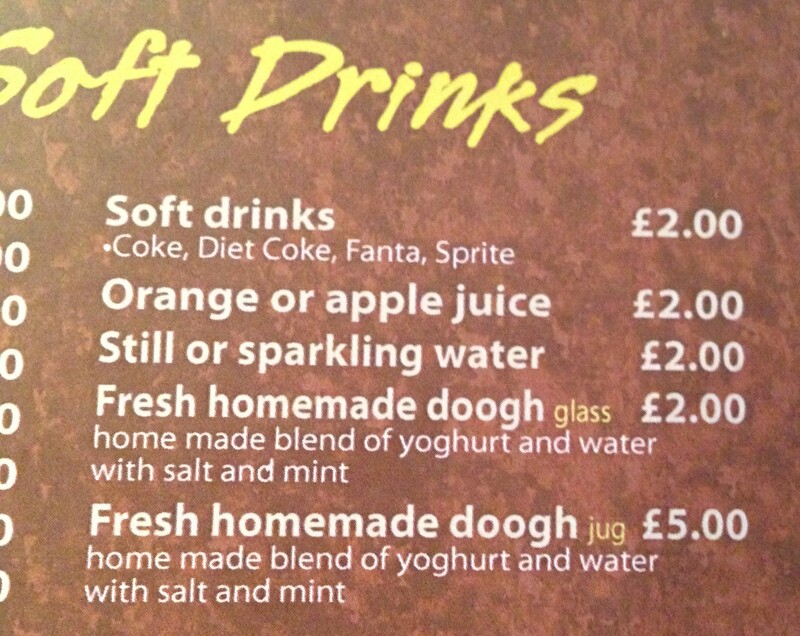 Fresh homemade doogh? I think if you own a restaurant in London you’ve got to avoid the obvious puns. Human civilisation emerged from the Caspian Sea? I think you’ll find the British civilised most places at the end of musket and a teapot. The very idea.